As a design educator who is passionately working in sustainability and systems thinking, I was enthusiastic at California Governor Jerry Brown’s announcement launching The Global Climate Action Summit. The announcement was made just seconds after our 45th president pulled the United States out of the Paris Agreement on climate change mitigation, which championed government, industry, and community leaders from around the world not only to continue to realize the goals of Paris Agreement, but to “take ambition to the next level.” Bringing together world leaders and civic society groups from around the globe, members of industry, creative professionals, celebrities and those who are leading the fight on the many pressing issues related to the climate crisis, the Global Climate Action Summit officially took place September 12-14, 2018 in San Francisco, CA. Working in sustainable design, I knew immediately I wanted to be a part of this global summit as call to action. Education is, in many ways is a call to action itself. A call to learn, to question, to grow, and to act, to be the next generation of leaders. With blustering hurricanes and raging wildfires surrounding us, the calls to action surrounding our climate crisis could not be more urgent. The fight is no longer about how to curb climate change, but rather, how will we now adapt to our ever changing natural and political landscapes so that we can not just continue to live, but also nourish and thrive. Designers must not only be part of this conversation, but lead the way in designing for new types of systems and interactions. Like many design educators, I am frustrated with the disconnect between education and industry, in both sustainability and design. I approached AIGA SF, my local chapter and the producer of Compostmodern, to organize an official affiliate event to the Global Climate Action Summit as a way to bridge these conversations. The connections we need to make are not just between design education and industry, but across all sectors. Designers and educators need to work hand in hand with engineers, scientists, psychologists, policy makers, civic leaders and a plethora of other fields in order to tackle the gigantic issues facing us in this climate crisis; which is why it was essential to me to make sure that design, and design education was included in the Global Climate Action Summit, and in the broader discourse of sustainability. Similar to the changing definitions of ‘sustainability’ over the years, ‘sustainable design’ has also shifted its focus. 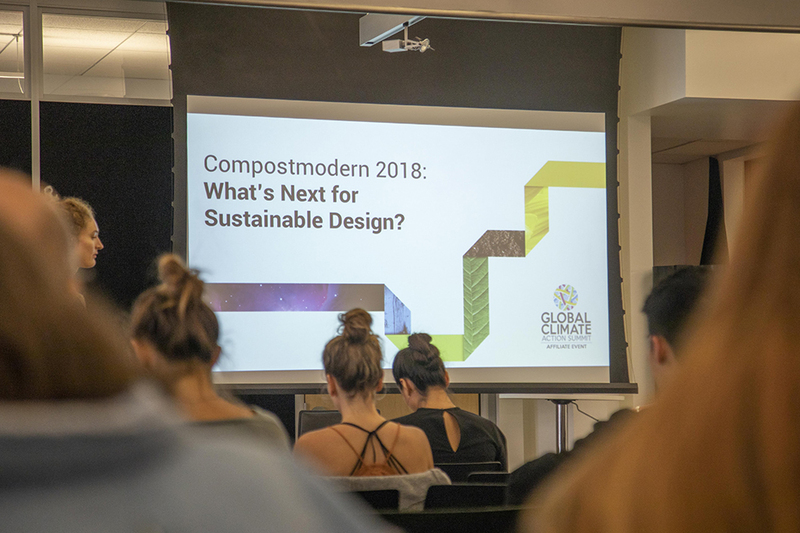 Our event, Compostmodern 2018: What’s Next for Sustainable Design, touched on where the profession has been, and where it might go in the future. Guiding this conversation was Brian Dougherty, the founding partner and creative director at Celery Design and Beth Rattner, the executive director at the Biomimicry Institute. As the moderator of Compostmodern 2018, I invited the audience to consider how as designers, they might be more like compost. Composting is a magnificent process that transforms waste into something richer, more nutritious, a conditioner for soil that nourishes the next round of crops. A truly dedicated (and humbled) educator is also like compost — wanting to educate students that will surpass the professor, becoming smarter, more cleaver, going farther, accomplishing something greater than the generation before. Early days of sustainable design focused on materiality where often times people thought, ‘let’s make it recyclable’ or ‘let’s make it compostable.’ Unfortunately this didn’t change our behaviors or consumption habits, and it didn’t really make anything “sustainable” as there is no “away” when “thrown away.” Today, we know that globally only a small fraction of plastic is actually recycled. And compostable products when not put in a proper compost stream, do not actually biodegrade. So the “simple solutions” of recyclable materials and compostable plastics don’t take into account consumer habits, user behavior or the larger systems our designs exist in. Brian Dougherty and Beth Rattner at Compostmodern 2018. Photos by Jake Herbig, AIGA SF. Brian Dougherty is also known for his 2009 book Green Graphic Design which follows the metaphor of “design as an avocado.” Through this lens Dougherty traced sustainable design practices moving through messaging (the outer peel), material choices (the inside stuff), and impact (the central pit). Dougherty shared several recent projects that Celery has taken on that move more towards impact design for communities. The Charlie Cart Project, is a mobile teaching kitchen and nutrition education program. Designed to appeal to both kids and adults, the carts and their lessons have been implemented in schools and communities nationwide. The Charlie Cart provides hands on lessons while encouraging healthy eating habits and behaviors that go far beyond the classroom. Pointing to the need for more systems design projects, Dougherty also shared the work Celery has done for DoveTail. DoveTail aims to unite groups of people to work together around issues of housing, food security, education and health. Seeing these as interconnected systems rather than separate entities can make a lasting difference to those who are impacted. Looking forward in the future Dougherty speculated we’d see more brands that have sustainability inherently woven into their mission, rather than a kind of “add-on.” Pointing to examples such as Impossible Foods, All Birds, and Tesla, as examples of products where environmental impact is a core part of the brand. Made possible in part my newer generations growing up with the knowledge of climate change, these brands “pull” people towards a better choice by creating an overall better product, rather than “pushing” people towards needing to make a more sustainable choice. 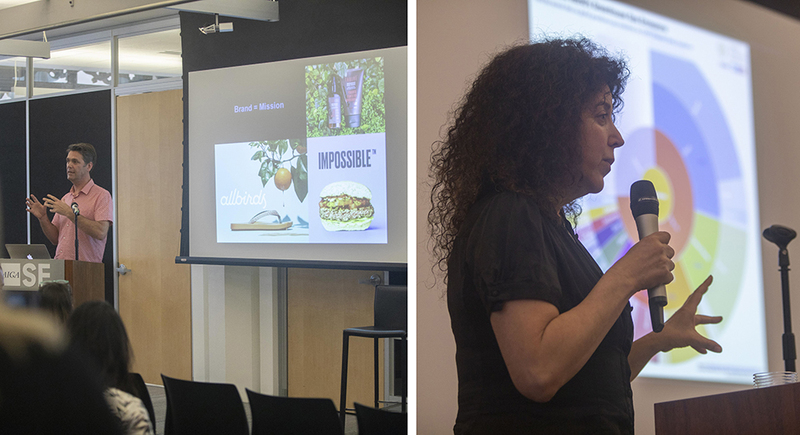 Beth Rattner, took the conversation further to explain how biomimicry can be used to inspire and solve design challenges. Quoting Janine Benyus “Natural organisms have managed to do everything we want to do without guzzling fossil fuels, polluting the planet or mortgaging the future.” Biomimicry is the practice of learning from and adapting nature’s ideas to the invention of more effective and ecologically-sound technologies. Not to be confused with extracting or harvesting things from nature (such as bamboo floors), biomimicry is what we can learn from how nature functions. Pointing to examples of some of the biggest polluters such as air conditioning, energy, concrete and water, Rattner shared examples of how designers have tackled these problems by asking how does nature does these functions. The PAX Fan uses nature’s spirals to pull air instead of pushing air, making air conditioning and fans more energy efficient and far less polluting. Frank Fish looked at flippers on humpback whales, and how their unique shape provides fluidity and lift as a way to create more energy efficient wind tunnels and fans. BluePlanet is a company that learned from coral reefs how to capture and use carbon to create cementitious materials, instead of traditional concrete that produces carbon dioxide. NexLoop designs biomimetic products and systems that collect atmospheric water for food production, similar to how spider webs and plants capture and store water. Rattner encouraged designers to look at the Biomimicry Institute’s website asknature.org to see many other ways that designers can solve problems simply by asking how nature has done it for thousands of years. At the heart of biomimicry is an understanding of the structures behind how people and products function. We can ask these same questions about our larger design world, and those we are educating in it. What are the structures we are designing for? How do our designs function in a wider systems view? 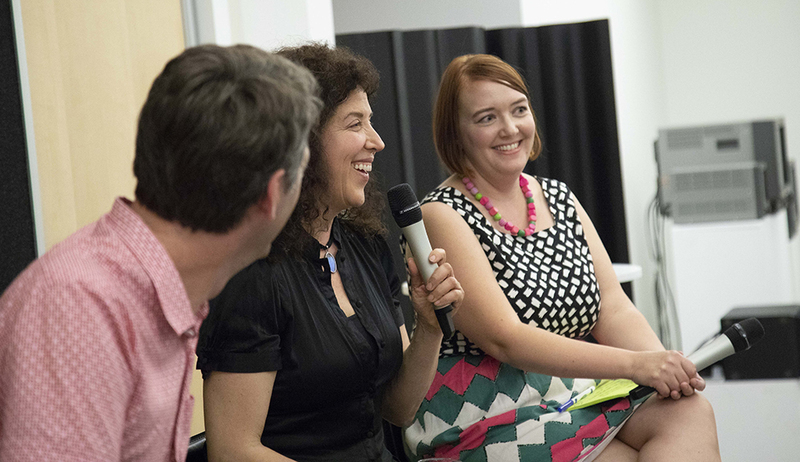 Brian Dougherty, Beth Rattner and Rachel Beth Egenhoefer in conversation at Compostmodern 2018. Photos by Jake Herbig, AIGA SF. Questions and discussions followed the two presentations spanning from technical to speculative, and cautious to hopeful. Design is no longer a profession of posters and logos, but one that must include designing systems, designing communities and designing for behavior change. Just as the Global Climate Action Summit was a call to action to unite leaders across sectors, designers, and design educators need to act and work across disciplines to take on these issues facing us in the climate crisis. Recapping the night we shared ideas for how designers can move the field forward. Design should be regenerative and collaborative. Using a pull towards behavior change and better choices is always stronger than a push. Nature has answers when we look for solutions to creating more efficient functions and structures. And lastly, to be generous designers (and educators), to be like compost – creating work that doesn’t just sustain, but that enriches and nourishes the next generation. Audience members engage in conversation at Compostmodern 2018. Photos by Jake Herbig, AIGA SF. 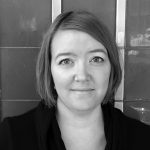 Rachel Beth Egenhoefer, is an Associate Professor of Design and Chair of the Department of Art + Architecture at the University of San Francisco. She teaches courses on Systems Thinking for Sustainable Design, Design Activism, Community Engaged Learning and others. She is the editor of the Routledge Handbook of Sustainable Design.